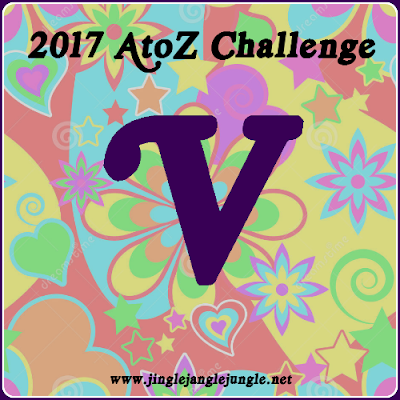 Today the #AtoZChallenge brings us to the letter V. These three songs were the top ‘V’ songs according to the Billboard Hot 100 Year-End lists. "Venus" is a 1969 song written by Robbie van Leeuwen. In 1970, the Dutch rock band Shocking Blue took the song to number one in nine countries. In 1981 it was sampled as part of the Stars on 45 medley. In 1986, the British female pop group Bananarama returned the song to number one in seven countries. The composition has been featured in numerous films, television shows and commercials, and covered dozens of times by artists around the world. "I got the idea from one of these anti-drug pamphlets they distributed in a school. It was very tongue-in-cheek." Peterik had an on again off again relationship with Karen after the song came out. Eventually they married and have been together for years. Fourteen seconds of the completed "Vehicle" master tape (primarily the guitar solo) was accidentally erased in the recording studio. The missing section was spliced in from a previously discarded take. "I remember that kind of feeling of experimentation. I also remember 14 seconds of the master of Vehicle being erased! We were doing background vocals and suddenly 14 seconds were gone from the master. No way to retrieve it. The second engineer had hit the wrong button. We spent two hours thinking our career is over, because at this time we knew we had something. Luckily, there was a Take One. They inserted 14 seconds of Take One and I redid the vocals. And now I hear it every time. From the second 'Great God in heaven' all the way up to the guitar solo--when you hear how abrupt that first note of the solo sounds, that's an edit." "A Very Special Love Song" is the title of a 1974 song by country music singer Charlie Rich. The song was written by Billy Sherrill and Norro Wilson, songwriters who had also written Rich's 1973 hit, "The Most Beautiful Girl". The song is included on Rich's 1974 album, Very Special Love Songs. "A Very Special Love Song" nearly reached the top ten on the Billboard Hot 100 chart in April 1974, peaking at #11. The song was able to top two other Billboard charts that year, as it spent three weeks atop the country music chart and two weeks at the summit on the adult contemporary chart. This was the second of four chart-toppers Rich achieved on the Billboard AC chart. Songwriters Sherrill and Wilson won a Grammy Award for "A Very Special Love Song" in the category Best Country Song at the 1975 ceremony. Tomorrow brings us the letter 'W'. Love it, Mary! Venus and Vehicle are two of my favourite songs. I used Venus as well. What a good year for music 1970 was! Charlie Rich; one of the few country artists I like from that period. Fabulous voice and the hair was cool. ;) The other is Freddy Fender. I wasn't sure if I had heard Vehicle before, but as soon as the music started playing, I knew I had. When I much younger, I used to walk around singing Charlie Rich's 'The Most Beautiful Girl', and I really liked Freddy Fender's 'Wasted Days and Wasted Nights'. I'll be around to visit soon.. but first, Sleep. Two awesome country songs, for sure and that's saying a lot, as I'm not a huge fan of that genre. Charlie and Freddy both had such unique voices. I second Debbie on this. Both Venus and Vehicle rev me up! Great songs that most people don't recognize by the titles. Good stuffs brought to you by the letter V.
I think my favorite band member of Shocking Blue is the INVISIBLE KEYBOARDIST. Ha!-Ha! They are definitely songs to remember. I always tend to forget the name of the group for 'Venus' and I always forget both the name of the song and band for 'Vehicle'. BTW - I received the book yesterday (I'm assuming it's from you) Thank you! I've got my highlighter ready to give it a good read. And nowwwww I am thinking about the RAZOR commercial! LOL! Great tunes! I really enjoyed the Venus video. Watching the drummer smile so sweetly made my day. And knowing the story behind "Vehicle" is awesome. Thanks for sharing! Oh, and you have heard the song you liked on my blog if you watched every episode of "Hell on Wheels". ~grin~ Remember when Cullen returned to the mining camp and Elam told him he was going to need a gun? The song starts there and plays all the way through while Cullen walks through the camp. We saved that episode on our DVR just for that scene. Be well! I had to look up the episode. ~grin~ It's episode two of season two, "Durant, Nebraska". I'm going to watch that show again. Mostly because I could watch Cullen all day long, and never tire of him! I never knew the group's name who originally sang Venus. Thank you for that! I wasn't sure if I knew all these songs, but I do. The Charlie Rich video wouldn't play for me. It appears it's copyrighted in my country so I'm unsure if I did know that song as well. Loved the 2nd song by Charlie Rich. V is for the Virtue of Value as you Build a Better Blog. #AtoZchallenge. Charlie Rich has a beautiful voice. The Ides (from beautiful Berwyn, Illinois) had another song, "LA Goodbye," that was a hit in Chicago the next year. They're still around, and Jim Peterik is still playing as a solo act as well. I remember being transfixed by Mariska Veres (Shocking Blue's singer) the first time I saw them on TV. Guess she passed away a couple of years ago. Mariska Veres passed away in December 2006. She had cancer. Jim Peterik has quite the talent. I recall reading that he has written a number of songs for some very well known bands. And, according to wikipedia, in 2009, he was 'guest security' on The Jerry Springer Show. Every time I visit your blog, I end up finding a new gem of a song. Today, I listened to "A Very Special Love Song" for the very first time and loved it. Thank you Mary. I hope to bring you more gems each day! Count me in as another fan of "Venus" and "Vehicle". I remember Charlie Rich, but don't know this song very well. I'm sure I've heard it, but probably not in 40 years or so. Don't feel bad. I didn't remember this particular Charlie Rich song, either. As we near the end of the alphabet, the obscurity of the songs become a bit more prominent. That happens from time to time, even though they were billboard hits, sometimes they just aren't that memorable for some of us. Venus was a popular song back then. It's a good one. 2 blogs in a row has Venus - must mean something.